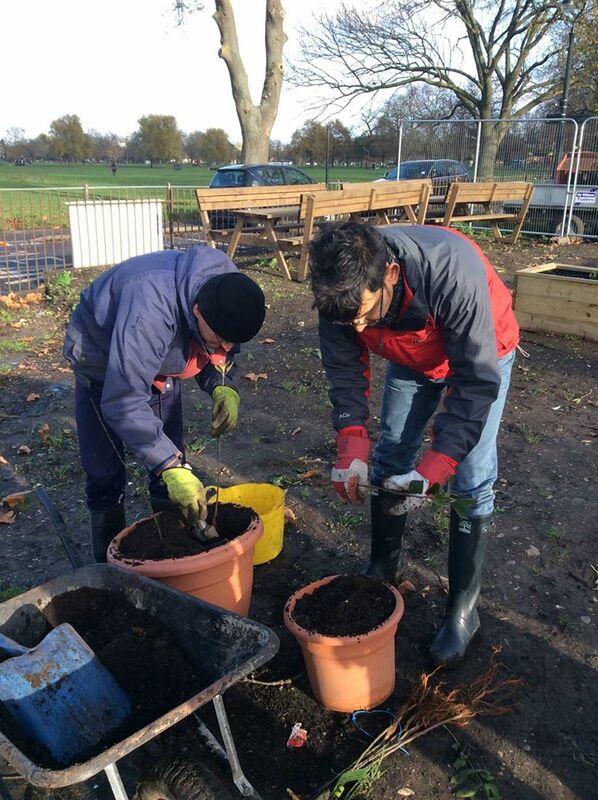 On Saturday 21 November 2015 we arrived at the Clapham Common community garden Saturday with everyone raring to get going with our fruit tree planting, but there was a problem… Unfortunately the nursery we’d ordered the plum, pear and apple trees from had notified us at the last-minute that the trees couldn’t be sent out. In order to be dispatched bare root the trees needed to have gone into their dormant period, when the sap stops rising, but because of the recent mild weather this has been delayed. 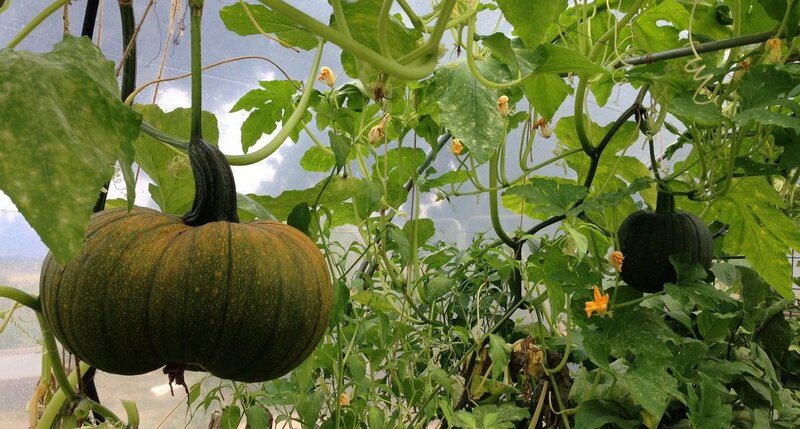 However, after Saturday’s icy wind and the recent cold snap they’ll be here soon! Fortunately, the 50 native fruit trees donated by OVO energy, including rowan and crab apple, had arrived so there was still plenty to do. These were potted up or heeled in at The Spinney beds for future planting around the green-waste site, to improve the habitat for birds and bees. 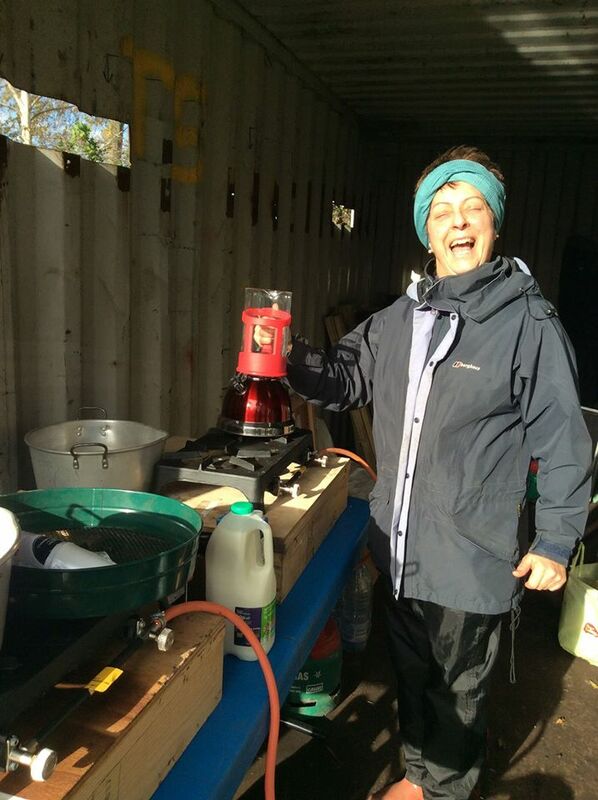 Finally, at the end of our busy morning’s work we were all pretty much frozen to the core, and it was a huge relief to get out of the chilling wind and into the shelter of the polytunnel where we warmed ourselves up with cups of home-made pumpkin soup, mince pies and mulled wine heated up the old shipping container. As well as enjoying the delicious home-cooked food it was a fantastic opportunity for the group to share gardening ideas for the future, especially with Wayne Trevor from Norwood Bzz Garage, who’d come over to help, and the Common’s new Park Manager, Joe Lewis, who is working on the improvements for the ‘the dump’. These include clearing defunct machinery that has lain idle for years, upgrading the recycling and composting and improving the wildlife habitat around the site. 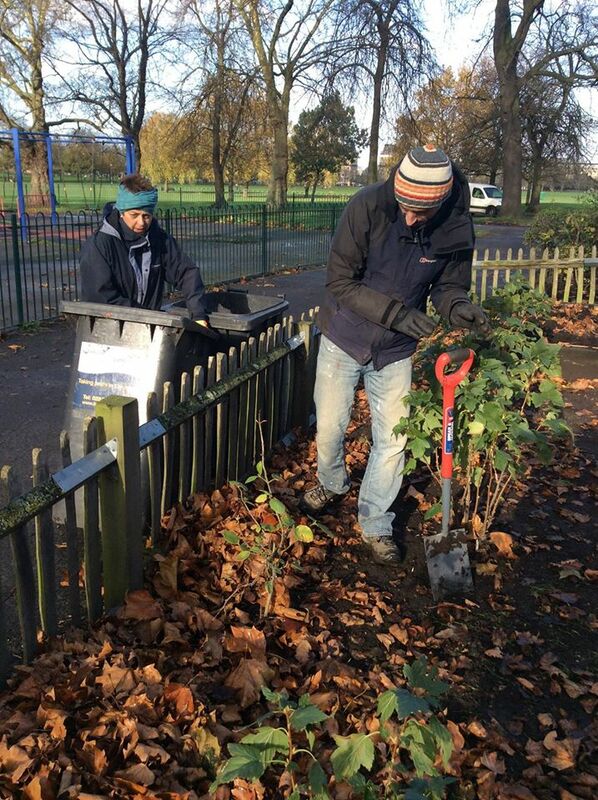 Tom Stannard from Age UK Lambeth had also dropped by to talk about our plans to set up gardening activities next spring for older people in the community. If this is something you would like to get involved in, email ccbandsatandbeds@gmail.com. 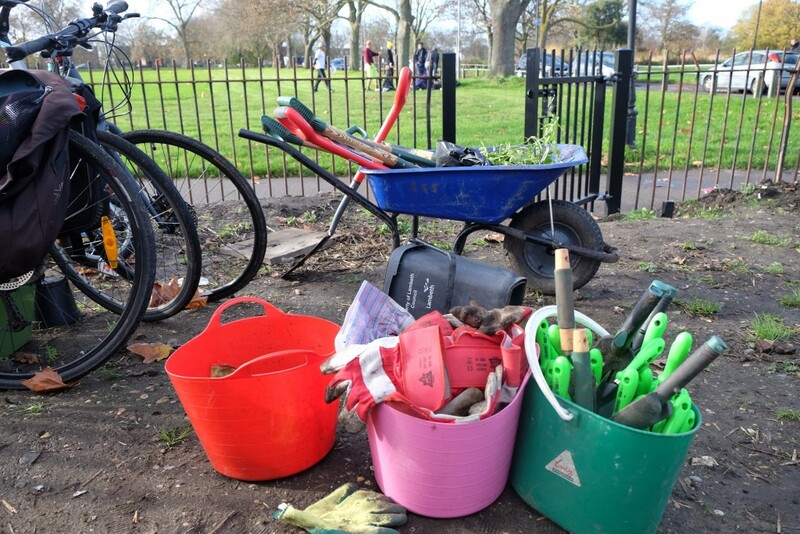 All in all Saturday really did turn out to be a fun and fruitful morning, and we can’t wait to get back on site to plant our trees – when they do arrive! 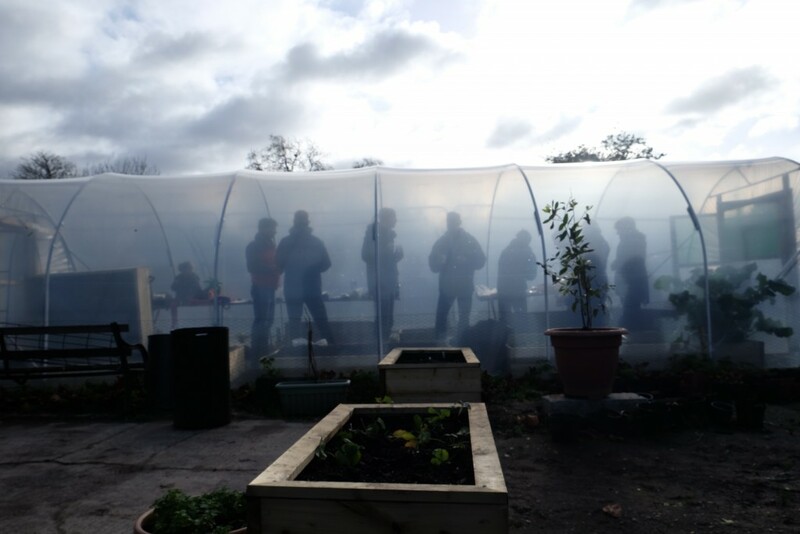 On Tuesday 8 December we will be holding a meeting to discuss our planting plans and the development of the new community garden in 2016 – followed by drinks to celebrate the successes of our year! The meeting starts at 7pm at the Metro Garden Restaurant & Bar Metro Garden Resaurant & Bar Drinks from 8pm. See you there!